Coverage: All England, Scotland and Ireland matches live on the BBC Sport website, BBC Sport app and Red Button, plus selected commentaries on Radio 5 live sports extra. 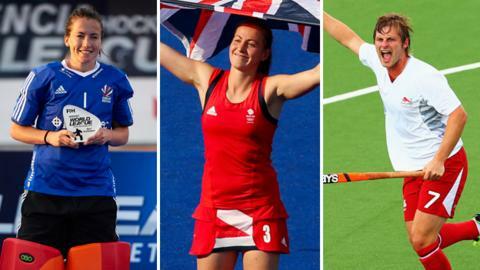 The EuroHockey Championships get under way at the Olympic Park on Friday, with the best eight men's and women's sides on the continent competing. England's men and women plus Scotland's women and Ireland's men are in action. England women were runners-up to Germany at the last tournament in 2013 while the men came fourth. Women's captain Kate Richardson-Walsh said: "Everyone is feeling really positive and excited to be able to play in front of a home crowd." BBC Sport assesses their chances, the star players and tournament favourites. England's men won the European Championships in 2009, but have had a succession of bronze and silver medals at major championships since. Many of England's squad will be boosted after helping Great Britain to secure qualification to Rio 2016 in Antwerp in July. Bobby Crutchley's side know they can make the semi-finals, but the real test will be to step up and push for the final. Ashley Jackson, with 83 goals in 123 games, is England's record goalscorer as well as being recognised as one of the world's best midfielders. Earlier this year he was top scorer in the Indian Hockey League and was named player of the tournament after captaining Ranchi Rays to the league title. As he prepares to join affluent Kent club Holcombe next season after 12 years with East Grinstead, his hockey stock remains as high as ever. England women arrive at the Olympic Park with the majority of the squad fresh from helping Team GB qualify for the Rio Olympics at the World League Semi-Final in Valencia last month. After winning gold in Spain and going seven matches unbeaten, they will have to handle the pressure of being one of the favourites for the European title, having not won the tournament since 1991. Maddie Hinch. The Holcombe player was named goalkeeper of the tournament at the World League Semi-Final. They only conceded two goals in seven matches, with much credit going to their 27-year-old stopper. The Scots are the lowest ranked team in their pool, but not the lowest in the women's tournament. They've proved they can stand up to England having pushed them close in a 2-1 defeat at the Commonwealth Games in Glasgow last year. They were also boosted by a 4-3 victory over European champions Germany at the Euro Masters in Hamburg last month. They will need an upset to get the semi-finals, but it is certainly possible. Emily Maguire. The Olympic bronze medallist is a rock for the Scottish defence. In 2015 she surpassed 150 caps for Scotland and Great Britain, making her international experience a vital resource for the Scots. The teams are split into two pools of four. All the teams in each pool will play each other once. Teams will receive three points for a win, one point for a draw and no points for a loss. The top two teams in each pool progress to the semi-finals. The bottom two play classification games. The losing semi-finalists go on to compete in the bronze-medal match and the winning semi-finalists play in the final to determine the silver and gold medallists. Away from the home nations, the Netherlands are the Olympic and world women's champions, but keep an eye on Germany, who are defending their European title. The same two countries will be favourites for the men's event, though Belgium will also be contenders.